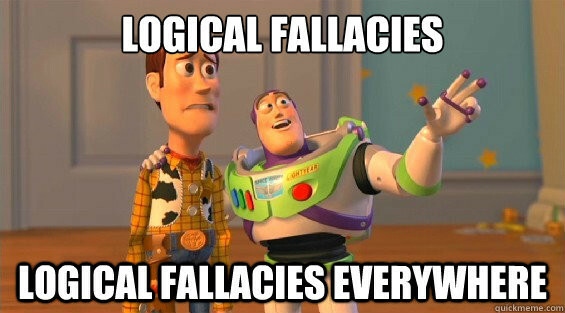 One of the most entertaining realizations when debating the religious is that there is not a single religious argument that is not fundamentally flawed or that does not contain at least one classic logical fallacy. You would all but expect some of the more extreme and less educated religious folk to employ such well known logical mistakes, but what makes it so comical is that even the best and brightest theists – scientifically and philosophically literate, well educated religious scholars – still make the same simple minded mistakes and/or employ the exact same logical fallacies (and how could they not?). Indeed, the only real skill that can be attributed to a talented religious apologist is how well they can mask the fallacies they employ. I always try to locate the specific logical mistake that my counterpart is making and then point out that many of the fallacies they employ are so old and classic, they actually have Latin names (as you will soon see). I recommend you acquaint yourself with these Latin terms, as the effect it creates when you point it out to your counterpart is well worth the effort. The following is a list of common mistakes and logical fallacies you might encounter during your religious debates. I present these in no particular order, and though there are many more fallacies than I can possibly list in this article, these are some of the most common ones. As you engage in your own religious debates, pay close attention to how the same mistakes and fallacies keep repeating themselves in different and imaginative ways in order to appear like they are fresh new arguments. As soon as you realize that all religious arguments are essentially based on the same list of fallacies, all you’ll need to do is peel some rhetorical layers off of them to uncover which familiar fallacy is hiding underneath. Does not follow (Non Sequitur) – a conclusion that does not follow the premise. The fallacy itself is contained in the connection between the premise in the beginning of the argument and the conclusion at the end. The actual non sequitur connection will usually take the form of a “therefore…” or “because of that…”. A common religious application of this fallacy is to claim that the bible contains moral laws (premise) and that therefore, a person who doesn’t follow the bible is immoral (conclusion). The easiest way to show that this does not necessarily follow is to simply point out examples that violate the conclusion (moral people who don’t follow biblical law, biblical laws that are considered utterly immoral today, bible followers who are immoral, etc). Argument from popular belief (Argumentum Ad Populum) – This classic fallacy holds that because a belief is very popular, it must therefore be true. You can expect to see it take the form of “The majority of the world’s population is religious, so religion must be true”. And then, of course “What makes you think that you’re right and so many people are wrong?” The best way to dismiss this argument is to simply point out that the entire world’s population used to once believe in witchcraft. The fact that belief in witchcraft is not as common today is all but irrelevant, since witchcraft is no less true now than it was when everyone believed in it. The similarities between witchcraft and religion, therefore, are almost too obvious to mention – almost. It is also useful to point out that most of the western world used to believe in Zeus/Jupiter at a certain point, but that this does nothing to support this deity’s existence back then. You can also point out that the fastest growing religion today is Islam, and then ask your counterpart if they think that Islam is therefore becoming gradually more true. Circular reasoning (Tautology) – an argument that restates the premise as the conclusion without adding any information or clarification. Pretty much all biblical arguments make this same simple fallacy – “The bible is the inspired word of god because the bible says it is the inspired word of god”. Another common example of this fallacy is the claim that religious belief is based on faith. Since faith is no more than a form of belief, this is logically identical to saying that religious belief is based on belief. The logic of this is flawed because a thing cannot explain itself by itself (this would be like trying to define a word by simply restating it) – you have to show how external information supports it or demonstrates it. I like to point out to my theist counterparts that if the bible is strong enough proof that Yahweh exists then a comic book is strong enough proof that superman exists. Argument from ignorance (Argumentum Ad Ignorantiam). This argument can take a number of forms. The original form of this fallacious argument states that if a thing cannot be disproved, it must be true. This often takes the form of “Since you cannot disprove the existence of god, he therefore exists”. The problem here is that no actual reason or evidence has been used to actually support the claim in the first place. Moreover, you are asked to prove a negative (lack of existence), which is impossible. The simplest way to show why this argument is fundamentally flawed is to simply point out that the existence of Lord Vishnu, Allah, Zeus, Odin and Santa Claus can also not be disproved, but this does not mean we should therefore accept the fact of their existence. Russell’s Teapot is one of the most celebrated refutations of this argument. ‘God of the gaps’. Though this is no more than a subcategory of the argument from ignorance, it is such a common manifestation of this fallacy that it deserves its own segment. The ‘god of the gaps’ fallacy is a defensive retreat that tries to plug god into any gap of knowledge that the scientific community, or just your counterpart, has yet to fill. You don’t understand the extreme complexities of photosynthesis or quantum mechanics? No problem – god must have done it. Scientists don’t yet know exactly what came before the big bang? Excellent – just plug god in there too. There are three general ways of dismissing this fallacy: The first is to explain to your counterpart how the thing he/she doesn’t understand actually works – if you can. The second is to admit that you too don’t know how the thing in question works, but that this doesn’t prevent you from admitting it – proudly admitting it – without desperately seeking a supernatural explanation with which to plug in gaps of knowledge. And the third is to explain the absolute absurdity of basing a knowledge claim on a lack of knowledge. This is a different way of saying “because I don’t understand one thing, I do understand another”. This type of nonsense can’t even rise to the level of a does-not-follow (Non Sequitur) fallacy, since there is nothing to even follow – the premise and the conclusion literally fly in opposite directions. You might also want to show your counterpart that the gaps in question keep getting smaller and smaller as science keeps advancing. Just like it used to be thought that lightning and earthquakes and comets were caused by supernatural deities before they were understood scientifically, so will today’s gaps be filled by future scientific explanations in the future. Science has never, in all of history, lost an argument to religion; and never has there been a reversal of a ‘god gap’ that had been replaced by a scientific explanation. The ‘god of the gaps’ is ultimately a losing battle that has been waged by religion for over 500 years. False choice – also known as false dilemma, false dichotomy, either-or fallacy. This logical fallacy asserts (wrongly) that there can be a choice between only one thing and another, or that if one thing is incorrect, the other must therefore be correct – all the while ignoring the possibility of other options. This mistake can often be found in the evolution-creation debate, where creationists will commonly assert that there can only be a choice between pure chance and supernatural creation – completely ignoring the possibility of slow incremental evolution through natural selection. This fallacy is also commonly combined with the argument from ignorance/god of the gaps, where it is asserted that either something just popped into existence for no reason, or god must have created it – completely ignoring other options that, as it happens, are being better understood as I write these words. The most important thing to remember here is that if your counterpart skillfully formulates his argument, and is clever enough to lure you into it, he/she could make you needlessly waste quite a bit of time trying to debate yourself out of a tough spot, before realizing that the entire framework of the debate had been based around a false choice. The best strategy is to detect the false choice you are being offered, and avoid making the mistake of taking this bait in the first place. Reduction to absurdity (Reductio Ad Absurdum) – an argument that attempts to establish the truth of a claim by showing that an absurd (and therefore false) result will follow from its denial. Though reductio ad absurdum is actually a legitimate argument, it is oftentimes misused in order to force an absurd conclusion. A good example is the common religious claim that it is just as absurd to be skeptical about the existence of god as it is about the existence of Caesar Augustus – since you have not personally seen either. This is a false reductio ad absurdum because it ignores evidence other than personal eyewitness evidence, not to mention simple probability, since Caesar Augustus was just a human being and god is supposedly a supernatural deity. Instead of trying to argue against this fallacy, a fun quick way to dismiss it is to simply show your counterpart what happens if you follow this argument’s logic even further. In other words, explain to your counterpart that if god is as real as Caesar Augustus (since you have seen neither), then so is Santa Claus, the Easter Bunny and the Tooth Fairy, since you have not seen them either. Then sit back and allow your reluctant counterpart to dismantle their own fallacy. Moving the goalposts – a method of denial by means of arbitrarily moving the criteria for proof or acceptance. This is a very common tactic in evolution/creation debates, where no matter how much evidence you will present, you will be told that it STILL isn’t enough evidence. This tactic can easily be dismissed as soon as you expose the double standard and ask your counterpart to present even a fraction of the amount of evidence they demand from you. Another common use of this tactic can be found in “god of the gaps” type arguments, where it will be asserted that god is necessary for causing any given effect. When you explain that this is not so, and explain that said effect has a natural cause, you will be told that something must have caused the cause you have just presented – thereby moving back the goalposts. This type of argument can go on for quite a while but eventually you will reach a point where your counterpart would have moved the goalposts so far back, that he/she will be left with no more than fuzzy, vague, philosophical abstractions. Once this happens, you can simply point out that the goalposts have been moved so far back from the original subject (physical scientific reality), that your counterpart’s unsupported claims are no longer of any real relevance. Argument from authority (Argumentum Ad Verecundiam) – an attempt to establish the truth of an argument on the basis of the speaker’s authority. This might very well be the oldest and most basic of all religious arguments – originally taking the form of an elderly shaman or priest, dressed in elaborate clothing and making loud and dramatic pronouncements about the wishes of the deity. Catholic papal authority and infallibility are prime examples of this fallacy, which pretty much boils down to “because I said so” types of arguments. Keep in mind that many religious apologists also try to assert that scientists, such as Stephen Hawking, are also guilty of this fallacy when they announce their conclusions about such things as the origin of the universe. But always make sure to remind your counterparts that when scientists make claims, they are basing them on open sourced scientific reason and evidence that can, and is, checked by many others; whereas religious arguments from authority are based on nothing of the sort. In many cases, you might be told that since you are not an ordained religious cleric or scholar, you are not up to the task of debating one, or dismissing religious claims. To this you can simply reply that in the same way you do not need to be a wizard in order to dismiss witchcraft or a Voodoo priest to dismiss nonsensical Voodoo claims, you also do not need to be ordained into any organized religion in order to dismiss whatever baseless superstitious claim you are being presented with. Appeal to consequences (Argumentum Ad Consequentiam) – an argument asserting that a hypothesis is either true or false based on the desirability of its truth or falsity. Common examples of this fallacy are: “God must exist because I could not live without him?” or “Atheism is false because it does not provide us with any consolation or a framework of morality” This is the core fallacy in the heart of all religious arguments for the usefulness, goodness and morality of religious belief – an entire category of religious debate that boils down to an attempt to replace objective fact with subjective self interest. It is almost embarrassing to have to inform one’s religious counterparts that the desirability of a religious claim is not proof of, indeed not even an argument for, its actual truth. Ad Hominem – a false attempt to dismiss an argument by criticizing the speaker instead of the argument itself. Anyone who chooses to engage in religious debates would be wise to not only detect and expose this fallacy for what it is, but to grow a thick enough skin in order to handle such inevitable personal attacks. Some of the most common ad hominem attacks in the context of religious debates, take the form of moral accusations – trying to point out that your argument is incorrect because you are an immoral nonbeliever. My personal favorite is when my dismissal of a religious claim is dismissed on the grounds of my lack of faith, as if it were a moral failing – and as if this moral failing (even if it actually existed) were a logical basis for dismissing my dismissal. An ad hominem attack is very often a desperate last resort attempt to lash out at you, indicating that your counterpart has run out of logical arguments and defenses, and that it might be a good time to end the debate.